"Over two thousand years ago, the Greek physician Hippocrates encouraged us to 'let food be thy medicine, and medicine be thy food.' Emerging research has supported this notion, and there is indeed a huge link between the foods we eat and our physical and mental health. To help us in this endeavor, Dr. Leslie Korn has given us a true jewel of a recipe card deck. 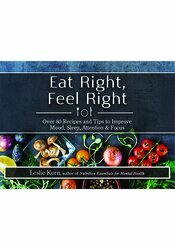 Whether you're struggling with depression, anxiety, insomnia, or day-to-day stress, Eat Right, Feel Right provides simple and manageable tips for a healthier lifestyle. Best of all, the recipes are not only good for you -- they're delicious too!"